Talk of moral hazard and contagion are back as emergency EU summits kick the can down the road for dealing with a troublesome peripheral member. Sound familiar? It wasn’t until the early hours of the morning that EU leaders emerged from their emergency summit today, having decided to grant the UK a six-month extension to the Brexit deadline. They were weary-eyed and exasperated, as they have been at Brexit summits over the past two years. But this time it wasn’t just Theresa May causing their annoyance. French President Emmanuel Macron tested their nerves last night as well. Macron kept the summit going for hours, insisting on only a very short extension in order to keep the pressure on the British to quickly make up their minds. Earlier in the week, he had threatened to veto the extension request entirely, which would have sent the UK hurdling toward a disorderly Brexit tomorrow. Even as he entered the summit, Macron was still holding out the possibility that he would kick the UK out of the EU before it was ready. And the language he used when speaking to reporters was strikingly familiar to those who have covered these summits for many years. Several diplomats and journalists noted that it reminded them of the most tense days of the Greek crisis. Measures must be taken to prevent the chaos in the UK from spreading to the rest of the EU, Macron said. Moreover, the UK cannot be rewarded for its bad behavior. If we indulge the British with constant extensions, he argued, they will never shape up and sort themselves out. It was a sentiment that has been expressed often in Brussels over the past week. The French president eventually backed down and agreed to a compromise of six months – not as long as the one year that Council President Donald Tusk and most other EU leaders were hoping for. But his comments reinforced a feeling that the UK is now viewed by the rest of the EU as a rotten apple – infected a virus that risks spreading to the rest of the continent. Greece too was a country on the periphery of Europe viewed as having taken bad decisions. Athens was refusing to address the problem, went the argument in 2011 and 2012, and by trying to save Greece the EU risked infecting itself. The best solution, many urged at the time, was a Grexit. Indeed, the ‘country plus exit’ portmanteau was invented for Greece long before it was applied to the UK ahead of the 2016 referendum. 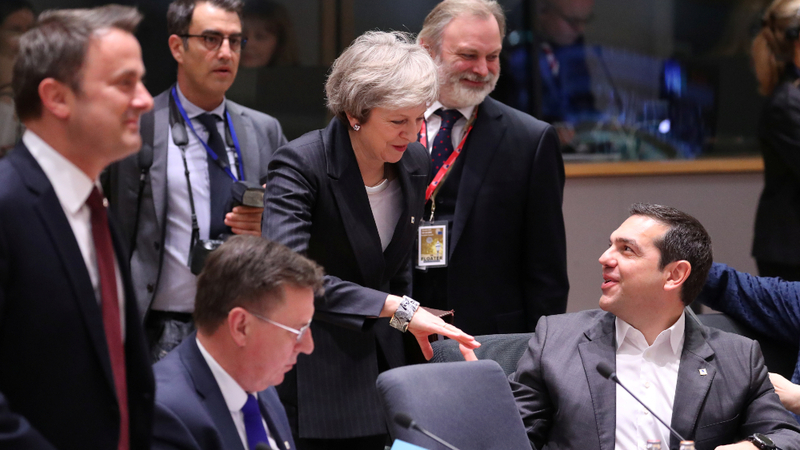 It was chiefly meant for a Greek exit from the euro, although there were also voices saying the country should be kicked out of the EU entirely. The difference, of course, was that Greeks didn’t want to leave the euro or the EU – at least not a majority of them. Then again, according to public polling this is now the case in the UK as well – with 55% of Brits now opposed to leaving the bloc. Just as the same kind of language is being used to talk about the Brexit and Greek crises, the same kind of solutions are being employed as well. In 2011 and 2012, the EU would decide to do the bare minimum to avoid impending disaster at each crisis summit, kicking the can down the road little by little. Now, as then, each new crisis summit results in the minimum required action, kicking the can further. The crisis remains, and festers. No leader leaving last night’s summit said they felt confident that the UK can decide a way forward any time soon. The mood about whether the UK can save itself has become overwhelmingly negative. It’s an oversight that seems eerily similar to EU’s supervision over Greece. ‘We’ll bail you out now, but we’ve lost trust in you so it will come with conditions’. In the end, there was no Grexit. The EU’s can-kicking was able to stave off disaster, though many economists say it made the crisis much longer and more painful than it needed to be. Will the same fate befall Brexit? Macron is only the most vocal of a camp of leaders who have had enough of the UK and think it’s best if the EU pushes them out the door as soon as possible. One wonders, in hindsight, what might have resulted from such hot-tempered solutions when it came to Greece in 2011. The EU’s dilemma is that it cannot solve the UK’s crisis for them. It has even less tools at its disposal than it had during the Greek crisis, when at least a quick debt collectivization might have nipped the problem in the bud. Only the UK can decide to end the Brexit crisis. All the EU can do is give them room to do so. But the conditions for being granted this breathing room are becoming increasingly humiliating. “Please do not waste this time,” Tusk warned the Brits after last night’s summit. Greeks can remember being told the same. Now Europe waits to see if the Brexit disaster can be averted as its predecessor was.